The vacuum steam process, ensures complete elimination of air from the chamber and sterilizing load. Thus, penetration of saturated steam into machine part openings and porous goods is secured. 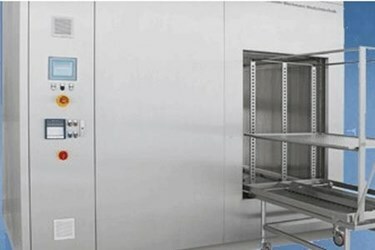 Heating and sterilizing is done trough direct inflow of clean steam. Supported by the heated jacket, the required sterilization result is achieved. Drying is done through further evacuation steps (simple or fractionated).